The CN Tower is one of the tallest free standing structures in the world and has been Toronto’s biggest tourist attraction since it opened in 1976. It was the world’s tallest for tower for more than 30 years, but lost that crown back in 2010. The tower dominates the city of Toronto and you can see it not just elsewhere in the downtown area, but also from miles away. When you visit, you’ll have to wait in line for your tickets and then for the elevator. The whole thing is like a military operation and it ran very smoothly when we visited. The first thing you’ll notice is just how fast the elevators are. You seem to whizz to the top in no time at all. One of the elevators has a glass floor. There are several floors that cling on to the top of the tower, but not all of them are open to the public. Some are used for the communications equipment that the tower was partly constructed for. There’s a revolving restaurant, with amazing views and the notorious glass floor that you can stand on or sit on and look down to the ground. It’s a strange feeling seeing the tiny cars below you. You can take an optional tour to the SkyPod for an extra charge. This is the highest observation point, but we decided that the view from the normal level was enough. A more recent experience that’s been added to the tower is the Edge Walk. This really is only for the brave as you’re attached to harnesses and encouraged to learn over the edge of the rim of the tower. We think that the CN Tower is a must-visit attraction in Toronto and with 2 million visitors a year, there are times when it can be busy and you have to wait in line. First thing in the morning is usually the best time to visit to avoid long queues. 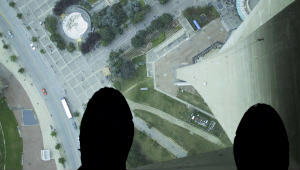 The CN Tower is open daily from 9am, closing at 10pm Monday to Thrsday and at 10.30pm on Friday, Saturday and Sunday. Basic adult admission is $32 plus an extra $12 for the SkyPod, but you can save money by buying online in advance. The EdgeWalk generally needs to be booked in advance and costs around $175. All prices correct as of 2014. The CN Tower is located on the edge of Lake Ontario in downtown Toronto, near to the Rogers Centre.